The Career Academy (TCA) is hosting a Career Explorations Fair for 9th, 10th & 11th graders and their parents to learn more about top career opt ions. It's never to early to start thinking about career choices for students. The Career Academy offers 11th & 12th graders experiences in hands-on learning in one of 20 career pathways. 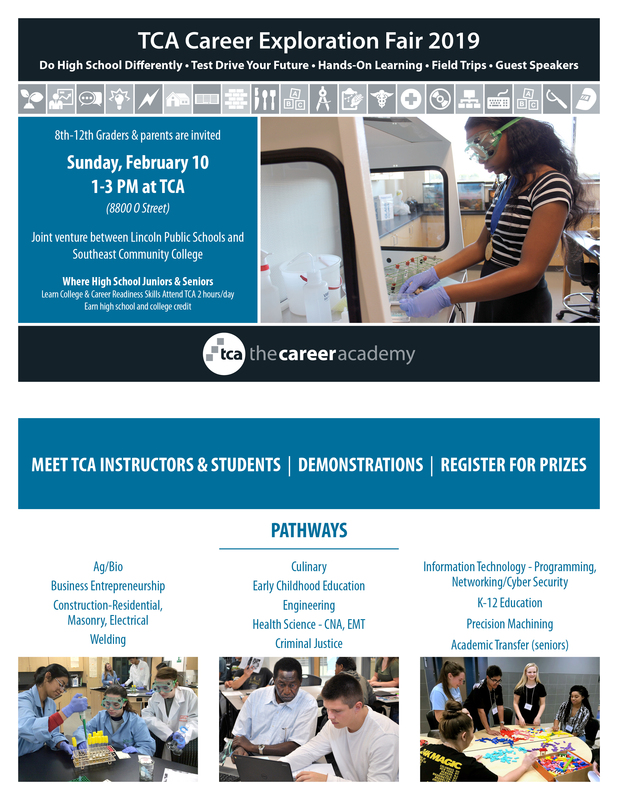 Attend the TCA Career Explorations Fair anytime between 1:00 - 3:00 PM on Sunday, February 10 at 88th & O. Park in the lower south parking lot at SCC, register for prizes, meet TCA students and instructors and see how "doing high school differently" can make a huge difference in your future success. Hope to see you there! On Thursday, February 28, we are hosting Girl's State Basketball! There will be NO school for students that day due to the basketball games. Finals for term 3 are March 7 and March 8. Please remember that we will NOT excuse students early from finals. Students are expected to be in class the entire class period so please plan accordingly as students will not be able to leave during class time. Beginning in the fall of the 2019-20 school year, parents will use ParentVUE to update census information for their students! Waiting until then to activate ParentVUE accounts creates a barrier to getting the census updated/completed. We encourage all parents/guardians to activate their ParentVUE account as soon as possible. A letter was sent home to all parent(s) who have NOT activated their account. If you did not receive a letter or have questions, please contact the main office. We need all parents to activate their account! See links below.